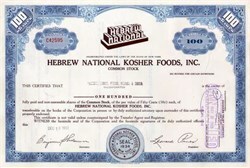 Beautifully engraved Certificate from the Hebrew National Kosher Foods, Inc issued in 1969. This historic document was printed by the Security Banknote Company and has an ornate border around it with a vignette of the famous company logo. This item has the printed signatures of the company's officers including its President, Leonard Pines and is over 34 years old. 1312 B.C. to 2000 A.D The development of the kosher food industry in the United States is closely aligned with Jewish migration. The arrival of millions of Jews, escaping persecution in other parts of the world, introduced kosher to these shores. The following is a brief chronological review of some of the highlights of kosher in this country, beginning with its origin in the Bible. 1312 BC A 40-year Israelite migration begins after 3 centuries of Egyptian oppression. The prophet Moses and his brother Aaron lead tribesmen and their flocks of sheep out of Egypt toward the Dead Sea in Canaan on a roundabout journey that will take them through the Sinai Peninsula, Kadesh, Aelana, and Petra. The wandering Jews are sustained by "manna," which falls daily from the heavens. Two portions fall on Friday, so that the Israelites will have food for the Sabbath as well. 1275 BC The Torah, given from God to Moses on Mount Sinai, imposes dietary restrictions that form the basis for kosher food requirements. Among these restrictions is a ban upon mixing meat and dairy products ("You shall not boil a kid in its mother's milk"). Kosher animals are those that chew their own cud and have split hooves. Fish must have fins and scales. Fowl have a very detailed list of requirements. 1654 The story of kosher food in America begins when twenty-three Sephardic Jews arrived in New Amsterdam. Following the expulsion from Spain in 1492, (known as the Spanish Inquisition), Sephardic Jews fled to Greece, the Middle East, England, the Netherlands, and finally the Americas. This particular New Amsterdam band first sought haven from the Spanish Inquisition in Recife, Brazil but eventually ends up in New Amsterdam. 1720 Mill House is the earliest known standing Jewish residence in the United States. This flintstone blockhouse, built around 1720, is adjacent to Route 9W, about twelve miles north of Newburgh, New York, in the Hudson Highlands. Luis Moses Gomez, the first of a distinguished Sephardic family to emigrate from Spain to America built the house, part of a trading station. The adjacent area became known as Jew's Creek. Mr. Gomez, known in Ulster County as "Gomez the Jew," traded furs with the Indians. 1739 New York Jews rely almost exclusively on Congregation Shearith Israel, the Spanish and Portuguese Synagogue founded in 1654 for kosher meat. By the middle of the 18th century New York kosher beef was being exported to Jamaica and Curacao. 1752-1755 Uriah Hendricks came to the Colonies in 1755. A Dutch-born Jew, who emigrated from England, he bartered goods against American raw products, primarily West Indian sugar. Very devout, he looked contemptuously on anyone who desecrated the Sabbath and ate forbidden food. He became president in 1791 of Shearith Israel, which had supervised kosher slaughtering in the city of New York since 1752. 1830's-1880 While early American Jews settled along the Atlantic Coast, the second wave that arrived after 1830 crossed the mountains to the Ohio and Mississippi rivers. Many like Levi Strauss, strapped packs on their backs and headed all the way across the continent to San Francisco, peddling textiles, kitchenwares, and other non-perishables as they went along. Jews have always been in the backpack business, selling spices, fabric, precious stones, anything that could be packed up easily when they were expelled from a country. It was a natural occupation for them, as they were rarely allowed to own land. In America, they became a familiar sight in the countryside before mail-order catalogues, like the Jewish-owned Sears Roebuck, put them out of business. Food, especially kosher food, posed a problem for them when they were traveling. Peddlers would often roast herring wrapped in newspaper over an open fire, or subsist on preserved or hard-boiled eggs and kosher sausage. On Saturdays the men created Sabbath communities in little towns where they met to pray. Often, as they made a little money peddling, they would buy a wagon and eventually settle in these communities, bringing their families from abroad. "The Jewish heart with its most beautiful blossom, parental love, thought in its happiness of parents living in need in the old country and would bring them over from Germany," wrote I.J. Benjamin, an observer of American Jewish life in the mid-1850's. "But the old father and the pious little mother, would not, in the late evening of their lives, have any part in eating forbidden food. The sons had no choice, then, but devoutly to accommodate themselves to true Jewish piety, according to the wishes of their parents, and also to appoint a shochet. The institutions that a Jewish community usually organizes were, accordingly, soon in existence. So arose one Jewish institution after another." While Jews were trying to balance Judaism and assimilation, great inventions were changing the United States. Coal and wood-burning stoves rapidly outdated open-earth cookery, the steam engine took the place of the horse and buggy, ready- made clothing eliminated handmade dresses, and refrigeration replaced endless salting, smoking, and preserving. The industrial revolution had reached America. 1869 One popular seltzer drink was Dr. Brown's Cel-Ray Tonic, which was sold in every Jewish New York deli. A doctor who treated immigrant children on the Lower East Side developed this seltzer, filled with celery seeds and sugar, in 1869. "Generation after generation was weaned on the stuff," said Harry Gold, marketing director of Dr. Brown's. "World War II's population explosion produced children who hungered for Dr. Brown's. Now you can find it in most states." In the early thirties before Coca-Cola became kosher, many Jews started drinking Cel-Ray soda as well as his cream and cherry sodas. 1870 Cincinnati's Gaff, Fleischmann markets compressed yeast wrapped in tinfoil that permits shipment anywhere; the yeast becomes popular even with ultraconservative bakers.Rokeach kosher foods has its beginning with a kosher soap company started on Wythe Avenue in Brooklyn, N.Y., by entrepreneur Israel Rokeach, who will begin marketing gefilte fish, borscht, and kosher jams under the Rokeach label in the early 1900's. 1871 Esther Jacobs Levy, author of the "Jewish Cookery Book", the first American kosher cookbook, written in 1871, was probably an English Jew living in Philadelphia. Mrs. Levy's recipes come from the different backgrounds of Jewry -- English, German, Sephardic, and American. Local dandelion greens are used in salads, and corn is cooked in a fritter resembling oysters, a popular nineteenth-century dish. In the 1870's "The New York Times" published one of the book's recipes for worsht, or sausage and rice, without acknowledging the source. 1883 Jacob Horowitz, a new arrival in New York from Hungary, rented a bakery, which he made ritually fit for the production of unleavened bread, Matzoh. In the first year, he was able to produce only a small quantity, but after his four sons, daughter, and son-in-law arrived in January, 1884, his business flourished. Five years later he bought his own bakery. 1886-1887 Dov Behr Manischewitz arrived in Cincinnati. He began as a part-time peddler and shochet for the Orthodox community, which had arranged for passage for him and his family. In 1887 he started a small matzoh bakery, which gradually became the B. Manischewitz Baking Company, the largest concern of its kind, with subsidiaries in all parts of the world. By the turn of the century Rabbi Manischewitz was shipping his product to England, Japan, France, Africa, Hungary, New Zealand, and Egypt. The matzoh - manufacturing pioneer owed his success to the invention of a machine that produced fifty thousand pounds of matzoh a day. 1888 A small New York dairy store opens at 135 Madison Street on the Lower East Side under the direction of Lithuanian-born merchant Isaac Breakstone, 24, and his brother Joseph. Isaac, who has been in the ice cream business after several years of peddling, arrive in New York 6 years ago and was greeted at the pier by Joseph, who had arrived 6 months earlier; their Madison Street shop will continue until 1895, and in 1896 they will start a wholesale butter business under the name Breakstone Brothers at 29 Jay Street, Brooklyn. 1901 "The Settlement Cook Book" began as a German-Jewish cookbook, created by a woman who sought to help the wave of immigrants that swept into the United States at the turn of the century. First issued in 1901 as a pamphlet containing one hundred German Jewish and turn-of-the-century American recipes, it has proved to be one of the most successful American cookbooks. Lizzie Black Kander, the daughter of German-Jewish pioneer farmers, compiled the "The Settlement Cook Book". She was also known as the Jane Adams of Milwaukee for her work on behalf of Eastern European immigrants. In 1896, Mrs. Kander, then chairman of the Milwaukee Section of the National Council of Jewish Women of Philanthropy (NCJW), established the Milwaukee Jewish Mission or settlement house in quarters borrowed from two synagogues. SUBSCRIBE TO Kosher Today, the only monthly trade newspaper of the kosher food industry and enjoy chock-full of information on kosher. Original articles and essays as well as the latest news. Only $25 PER YEAR or $40 for two years..
1905 Production of edible coconut fat, suitable for cooking, begins at Ringelshain, Bohemia, and the fat is marketed under the trade name Ceres. Sales of Ceres grows quickly introducing a kosher brand which gains favor among Galician and Hungarian Jews, since the dietary laws prevent Jews from consuming lard. Hebrew National Foods has its beginnings at New York, where Isadore Pinkowitz starts producing kosher frankfurters. His son Leonard Pines will take over the business after Pinkowitz's death in 1936, and the enterprise will grow to have a line that includes salami, sauerkraut, mustard, and other kosher products. The New York dairy restaurant Ratner's opens in April on Pitt Street serving soup, gefilte fish, whitefish, and a few other kosher dishes under sanitary conditions for the city's large and growing Jewish population, which is concentrated on Manhattan's Lower East Side. Jacob Harmatz, 21, and Morris Ratner, 22, have flipped a coin to decide whose name would be on the front, and Harmatz has lost. 1908 Barney Greengrass opens a shop at 1403 Fifth Avenue in New York and becomes known as the sturgeon king. 1911 One of the most important prepared products for the Jewish housewife was the invention of Crisco in 1910. Three years after the product was on the market, Procter & Gamble was advertising that Crisco, a totally vegetable shortening, was a cheap and kosher product for which the "Hebrew race has been waiting 4,000 years". Procter & Gamble, who obviously had done their homework on the Jewish consumer, advertised in the Yiddish press with ads depicting housewives making potato pancakes and strudel with Crisco. In 1933, P & G published a bilingual (yiddish/english) booklet, "Crisco Recipes for the Jewish Housewife." 1912 "The Settlement Cookbook" (see 1901) is in its sixth printing. 1915 The New York State Legislature enacts the nation's first Kosher Food Law, which was to serve as a model for all subsequent kosher food legislation. It prohibits passing off non-kosher food as kosher and requires stores selling Kosher and non-Kosher food to post signs stating that fact. 1916 New York entrepreneur Aaron Streit, who has gone into partnership with Rabbi Weinberg and opened a matzoh bakery on Pitt Street on, introduces Streit's Matzoh Manhattan's Lower East Side. Aaron's son Jack took over and built the company into a manufacturer of 130 different kosher products doing 65 percent of its business before and during the Passover season. 1921 Eight years after Leo Linderman arrived in America, he launched Lindy's on Broadway where he marketed deli food so well that it was popularized as "Mindy's" in Damon Runyons writings (Guys and Dolls, etc.). The Washburn-Crosby Co. later to be known as General Mills publishes "Gold Medal Flour Cookbook." 1924 The Union of Orthodox Jewish Congregation of America was founded in 1898 as a means of bringing cohesion to the fragmented immigrant Jewish populations offers Rabbinic supervision for foods. In 1924, it created its women's branch, and four years after women won the right to vote, the Union's official kashrut supervision and certification program was introduced. 1927 Lender's Bagel Bakery is founded in New Haven, CT by Harry Lender (and subsequently managed by son Murray) to produce the hard glazed rolls that have been known since 1919 as beigels. The word bagel is used for the first time by some accounts, a variation on the Yiddish word beygel, which had been spelled beigel since 1919. The hard glazed roll willgrow to outsell donuts in the U.S.
1928 Isadore Pinckowitz, a Romanian butcher, who peddled meat from the back of a horse-drawn wagon, started making kosher sausages and hot dogs in a sixth floor walk up on the Lower East Side and sold them to Waldbaum's, the largest grocery chain catering to Jewish households. 1930 Maxwell House publishes its first corporate-sponsored Passover Haggadah that is ultimately reprinted several times and distributed in the millions. 1934 Monarch Wine is founded in Brooklyn to produce sacramental wines for use on religious occasions in place of homemade wines. Monarch will lease the name to Manischewitz and will also bottle wines under 17 other labels as it grows to be the largest U.S. producer of fruit wines including blackberry, cherry, elderberry and loganberry. 1935 The U.S. Supreme Court strikes down the National Industrial Recovery Act (NIRA) in ruling on the Schechter Poultry Corp., a case about a kosher slaughterhouse that is processing "sick chickens". The act which set maximum hours and minimum wages violates the constitution. Heinz vegetarian beans are endorsed by the OU. The late Frank Butler is Heinz's first full time mashgiach (Rabbinic Supervision). The Organized Kashrut Laboratories (O.K.) is established by Abraham Goldstein and quickly becomes one of the largest kosher certification agencies. 1937 Celebrating its 60th Anniversary, the Coca Cola company obtains Kosher certification. 1938 Empire Kosher Poultry, Inc. was started in the Catskills by the Katz family. 1940 Stephen Klein opens his first Barton's Candy Store in New York, selling kosher chocolates. He has 50 stores in 10 years. "The Settlement Cookbook" sells its 500,000th copy. 1943 B. Manischewitz Sales Company (Distributor) was started. 1945 Eugene Herzog, whose family had been making savory kosher wines in Czechoslovakia from 1848 until the Holocaust, came to this country after World War II. On the bottles was the inscription: Herzog's wine. Phillip Herzog, fifth generation in the family business rebuilt in America as Royal Kedem Wine Corporation. 1946 The arrival of tens of thousands of Holocaust survivors puts new life into the U.S. kosher food industry. Many of the immigrants bring their strict kosher standards with them. They bring diverse skills to this country and open manufacturing plants, retail establishments, or go into foodservice. 1947 Certification comes to Baltimore when the orthodox Jewish Council offers rabbinical supervision. It ultimately becomes the Star-K, one of the nation's leading kosher symbols. 1956 The Hungarian Revolution forces tens of thousands of devout Hungarian Jews into exile; most come to the U.S. shores and become a major factor in the growth of the Kosher food industry. 1962 Lender's bought and made operational the first bagel machine. This enables them to significantly expand their markets and ultimately leads to the production of frozen bagels. 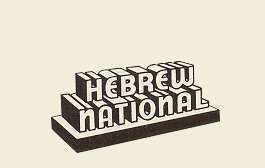 1965 Hebrew National hot dogs launch an "We answer to a higher authority" ad campaign to appeal to Jews and non-Jews alike. It quickly becomes a symbol of quality for all classes of consumers. Levy's rye bread also comes up with a campaign to lure all classes of consumers. It's "You don't have to be Jewish to like Levy's" is on billboards everywhere, some with an Indian chief eating the bread. Historical note is given to the first "mass" marketing of traditionally "Jewish" foods. Arguably, through these ads "kosher" took on a special meaning for the mass market - cleaner, more carefully prepared foods. 1969 The Kof-K Supervision Agency is founded. Based in Teaneck, it is one of the 5 largest in the nation. 1972 The first Establishment Clause challenge to a Kosher food law in some 50 years arouse an effort to enforce the Kosher food ordinance in Miami. By now, many states have consumer protection laws for Kosher, mostly modeled after New York State's extensive statutes to protect kosher consumers. 1987 The first International Kosher Food and Jewish Life Expo is held at the Jacob K. Javits Convention Center in New York. More than 50,000 people attended as an additional 50,000 could not get in. The show which was a combined consumer and trade show moved to the Miami Beach Convention Center in December attracting 25,000 people. 1990 Congressman Stephen J. Solarz (D-N.Y) introduces the first ever Federal Kosher Consumer bill in the U.S. House of Representatives. 1992 The New Jersey Supreme Court declares the states Kosher Laws as unconstitutional. But when the U.S. Supreme Court declines to hear the case it stays within New Jerseys borders. The state continues its active enforcement against consumer fraud in Kosher, which the court said was the state's obligation. 1993 ConAgra acquires Hebrew National Foods . Sara Lee acquires Bessin Corporation (Best Kosher Sausage). New figures show the dramatic growth of kosher foods: Ethnic Kosher Food Sales are $2 billion. 1.75 million of the 6 million customers for kosher foods are Jewish, the rest are Muslims, Seventh-day Adventists and others who consider kosher food healthier. Coca-Cola, Coors, General Mills, Hershey, Kraft, Nestle and many other mainstream food companies have obtained kosher certification. Others like Dannon switch to alternate certifications, which they feel appeal to a broader audience. 1994 The number of product lines produced by Hershey Foods in Pennsylvania nears 150. 1995 Bagels are the #2 frozen food category after orange juice in grocery stores. Bagels out number donuts in California. 1999 For the sixth consecutive year, the kosher food industry experiences 15% growth, reaching more than $4 billion in sales. Manischewitz head Richard Bernstein, who acquired the company for $124 million last year, outlines company's plans for mainstream consumers and targets 40% growth. Lou G. Segal's, one of America's oldest kosher restaurants, sells its commissary to Weiss Kosher Cuisine after closing the restaurant portion of the business two years earlier. Segal was the first kosher airline caterer. The first glatt kosher Nathan's in U.S. opens in Brooklyn Star-Kist targets kosher and pareve market Wal-Mart pursues kosher market, including the opening of a store in New York's Catskill Mountains. |Miller's Beer obtains OK certification Wilton Foods acquired by Cohen's Kosher shopping on the Internet on the rise Kosher packaged goods in U.S. reaches $130 million Kashrus Magazine reports 366 kosher certifications on food products in the U.S.